Chess Beginners may find this game difficult to understand, but take it easy. Just let the ideas sink in and use common sense. Don't look at the chess pieces, but use X-Ray Vision instead. This means, if you see a knight, then you just try to imagine the squares that are controlled by the knight. But don't look at the knight itself. Chess is all about controlling squares, never forget that! When you look at any chess position you should see just the squares, lines and rows in your mind, that are controlled by your pieces and by the opponents pieces! This is scary, isn't it? Don't worry! You will get used to it after a few years of playing chess. Some players learn it faster, some slower, some never. But first you have to know, that it is important to look at chess this way. Somebody has to tell you and that's me at the moment. So if you look at the Queen, you don't see the Queen, just the squares which are controlled by it. When you look at a knight, you try to see just the squares that this knight controls. When you see a bishop your mind will see just the squares that this bishop controls. Get this! 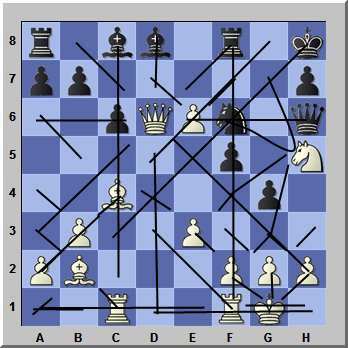 A piece (knight, bishop, rook or queen) does NOT control the square it sits upon. See below! Black plays a dubious opening and attacks as soon as he can. He is not developed fully yet. His queenside bishop is sitting on its original square like a dead duck and is not participating in the attack at all, but disturbs the coordination of Blacks Pieces instead. The black attack is only supported by a few pieces and is running into nothing. White strikes back in the center and wins.